I'm pleased to say I've made it through another Christmas, another birthday, and I've seen another new year roll in this past month. That means it's time for a list of resolutions. Have you made your list yet? Mine is a mile long. I'll probably share it with you before the month is out, but before I do, I want to tell you a story. Several months ago, my mom and I decided to have a garage sale. I knew I had "stuff" everywhere that hadn't been touched or used in forever, so it was time for it to go. We will have been in our house for about thirteen years this summer, and I hadn't performed a good house cleanse since the move. 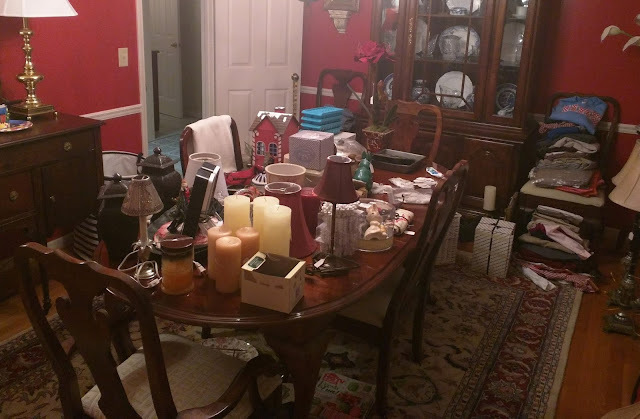 I started cleaning out packed, catch-all drawers, exploding closets, and cabinets running over with a little bit of everything. We also hit the attic and the outdoor storage room off the garage. It's amazing how quickly you can fill up your space. 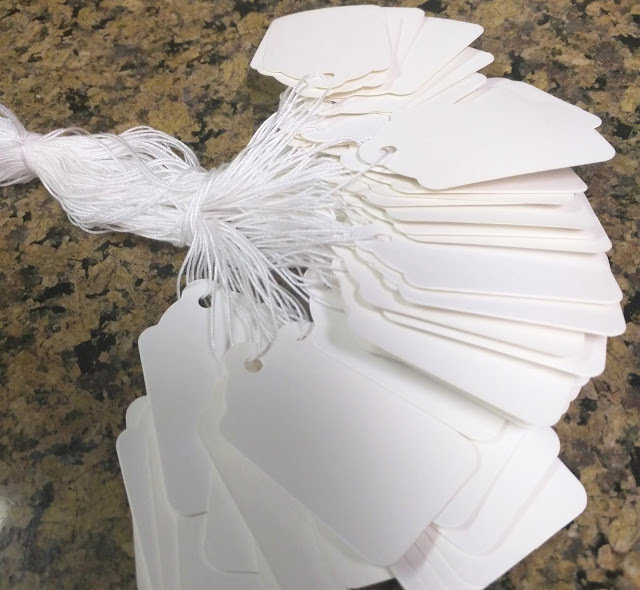 I ordered these handy, easy-to-use tags from Amazon to do my pricing and spent the minutes I could spare tagging and pricing my items. 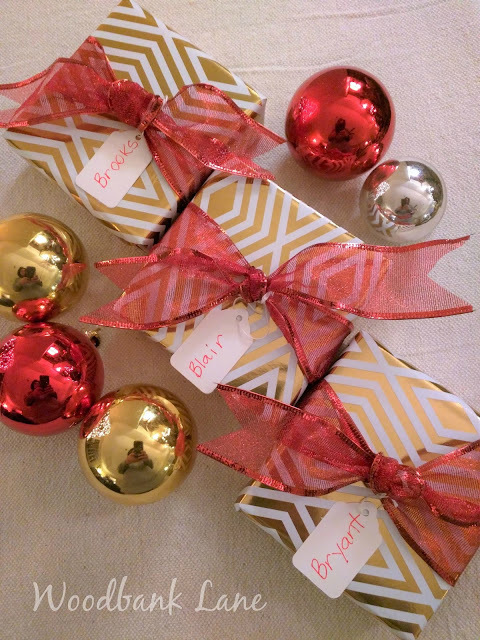 I had a bunch left over and used them to label my Christmas gifts. My dining room became garage sale central, which drove me crazy! It looked like this for months. We set up shop, displayed our goods, sent my daddy to Lowe's for signs to advertise the sale, went to bed (eventually), and hoped all of our preparation would "pay off." We awoke to a dreary, cold day that required a LARGE cup of coffee to get our motivation flowing. Clearly, the customers believed "the early bird gets the worm" because the minute we put the door up, ready or not, the cars started rolling in. She was our best customer. She loved our stuff. She bought a little of everything: clothes, jewelry, and decorations. The pile she had to pay for included things that belonged to my mom and to me. As we were separating the items to determine how much she owed each of us, this is what she said and it stung me. What? Our old, no-longer-worn clothes, household items, small electronics, shoes, candles, and Christmas decorations could be a blessing to someone? She was right. I had no idea. I hadn't thought of it that way and it never occurred to me that anyone else might think of it that way either. I looked at her for a split second like she had two heads. It caught me so off guard that someone could have that kind of a perspective about a garage sale. In that moment I was quickly reminded that my attitude-my perspective-could probably stand a little tweaking in all situations and is probably one of the most important determinants of any outcome. I can't seem to get that little lady out of my mind. Isn't it funny how God can use the smallest interludes to make the biggest impact on and in our lives? Having a better attitude and adjusting my perspective daily is definitely on my resolution list for this year thanks to that sweet stranger in my mom's carport on a yucky Saturday back in late November. I hope 2017 is your best year yet!